While not posh, the surroundings at the varying fabric warehouses where we purchase our goods are certainly neat and clean and the people are extremely helpful and always polite. Which is apparently more than can be said for some of those playing tennis on Day Four of Wimbledon, hhmmm? To be a bit more precise, more than can be said for at least one of the parties playing on Court One yesterday? (Thursday, Day Four of play by the time anyone reads this as it is being written rather late.) My goodness. We’ll get to the “He said, she said” part of it in just a sec, but first we wanted to wade through a few of these SALE notices we feel we should share with everyone. And we think we need time to gather our wits as we’re still reeling and essentially sitting here at the iMac not wanting to go down the “Can you say catfight on Court One?” route. That would just be so totally tacky and beneath us. Completely. Beneath. Us. So let’s chat about it being that time of year when the notices of summer SALES and increased savings and greater markdowns and deeper discounts and moremoremore buybuybuy information keep flying into your electronic inbox, not to mention all of the literature your poor postal employee has to cope with delivering to your humble abode. And may we talk about the Doorman? Is yours as, well, cranky as ours is becoming? Honestly! I wonder if he’ll go completely ballistic if Cook takes him down an iced Prozac Latte…. Keeping track of the flyers and email notices is almost a fulltime job in and of itself. At least that’s what our Social Secretary keeps telling us. But then that’s why you have The Princess, to help sort through everything and separate some of the wheat from the chaff, yes? And we must say, surfing the yummies for Boys and Girls at Best & Company is a delightful escape in and of itself, a brief respite in the midst of a chaotic evening. After all, how could you not fall in love with the little Blue Pique Dress shown up above on the right and below left, or the little floral frock below right? Especially when the ‘Sneak Peek’ for the Annual Summer Sale provides an additional 10% off the SALE price. (If you can’t read the code, it is SUMMER08, and it is good through midnight June29th.) And that additional 10% will come in handy when you see this Pink Paneled Joan Calabrese dress with the grosgrain ribbon and bows. I swear, if I could take a pill to shrink me down to that size to wear that precious little dress, I just might swallow it. For that matter, the Dolphin Embroidered Dress is pretty difficult to pass on as well. And when it comes to this jaunty nautical sweater for infants, there’s no debate; you can pair it with the all cotton stripe cotton shortall, also for infants. We must move on to our next retailer, The Village Palm, which happens to be a Lilly Pulitzer signature shop, and where they have loads of Lilly on sale for 40% – 50% off for Men, Women and Kids sizes, well worth a stop if you have the time. And you can snag a copy of Essentially Lilly if you don’t already have one, for the amazing price of ….drum roll please….only $15. Okay. We seem to have recovered our equilibrium enough to at least approach the Wimbledon conversation, which is really not that big of a deal in the grander scheme of things but really seemed so… so… well, so extraordinarily bizarre when one considers the level of decorum generally used courtside. The whole thing is actually very silly on the surface, until one considers the role model issue. I don’t know about you, but there are an awful lot of teenage girls at the club who watch the ‘women’ (many of whom are little more than girls themselves) on the tour very closely; their clothes, their shoes, their rackets, their makeup, their accessories and jewelry, etc., and their behavior. Why does this matter? Because good sportsmanship and civility are important characteristics all of us need to exhibit at all times, but especially when we are on a larger platform. Like Wimbledon. 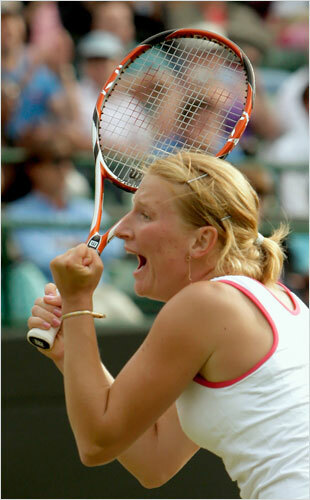 After we have just beaten Number 3 seed Maria Sharapova. 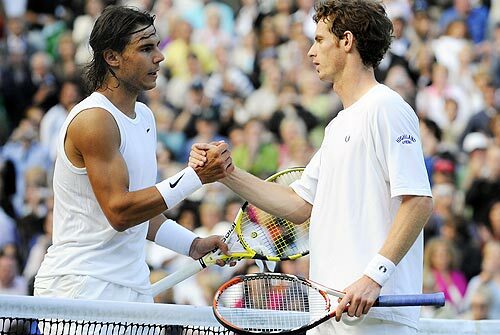 Who won Wimbledon in 2004. Which would have been the gracious and courteous thing for Sharapova’s opponent, Alla Kudryavtseva to do. Unfortunately it didn’t play out that way. Youthful exuberance is understandable after such an enormous upset, especially for the young woman who is a fellow Russian. Who is ranked 154th in the world. She said it was a pleasure to beat Sharapova — and not just because she is the biggest star in the women’s game. “Well, I don’t like her outfit. Can I put it this way?” she said with a grin. It is clear Kudryavtseva does not like the the level of attention devoted to fashion, and its dominate role in professional tennis. She comes from a family with a strong sports background: her father is a world champion wrestler. As best The Princess recalls, Wrestling does not dedicate this amount of time and attention to fashion and it would seem they are better off for it. As far as Kudryavtsevas’s concerns about upsetting Sharapova with her comments, that is clearly not a worry. Petty? Perhaps. But pettiness breeds contempt and contempt usually breeds rivalries. And, as far as I can tell, that’s exactly what tennis needs. If it happens to come from two attractive European women who take pleasure in destroying one another on the tennis court, so be it. To be fair to Kudryavtseva, not all of her comments were of the nature seen above. Some could be looked upon as those coming from a professional on the Tour, courteous and civil (we’re not even asking for gracious at this point, agreed?) most of the time. None of us is perfect. Don’t we all? The princess has had quite enough of this topic for the day; haven’t you? Our next post will showcase several more *very* good sale notices we’ve received in the last two days or so, and we will update another Wimbledon fashion statement generating lots of buzz, the Federer cardigan. We’ll also share one more little dress that had prima ballerina types and fashion folks chatting it up together!